Thrill seeker? Lover of off road vehicles? 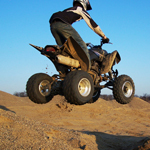 ATV Rider is the perfect depiction of that high adrenaline fun. Rider seems to leap of the page on a quad in this bold sporty design.